Nubia Red Magic₹ 29,999, the anticipated gaming smartphone that was unveiled in China earlier this year, has now been launched in India. The new model is targeted at gaming enthusiasts and comes with an ergonomic design that sports an RGB strip. It also comes preloaded with a proprietary tuning software called GameBoost that is touted to enhance your gaming experience by freeing up memory-intensive resources. The Red Magic also features an 18:9 display and has 8GB of RAM. 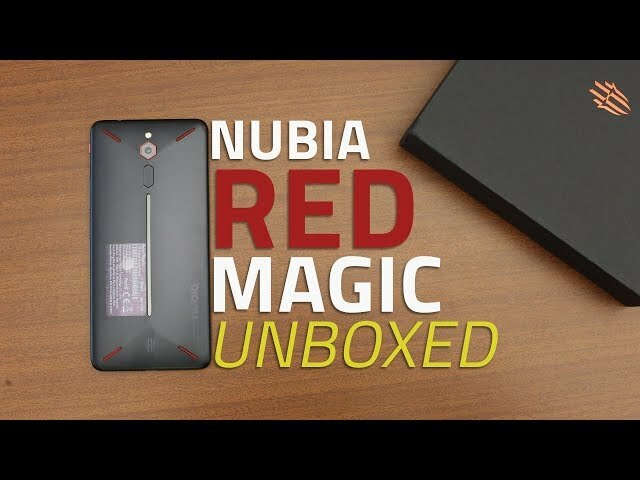 Nubia has tied with Amazon India to start selling the Red Magic in the country starting Thursday, December 20. The Nubia Red Magic price in India has been set at Rs. 29,999 for the lone 8GB RAM/ 128GB storage variant. The smartphone will go on sale exclusively through Amazon.in starting 12am IST (Midnight) on Thursday, December 20. To recall, the Nubia Red Magic price in China starts at CNY 2,499 (roughly Rs. 25,400) for the 6GB RAM/ 64GB storage variant, while its 8GB RAM/ 128GB storage model is available at CNY 2,999 (roughly Rs. 30,500). The phone also got a price tag of EUR 450 (roughly Rs. 36,000) in European markets at the IFA show earlier this year. Specifically designed for mobile gamers, the Nubia Red Magic features a dual air convection cooling system that is designed with three cooling ports, additional layers of graphite, and topped with a convex-styled back. This is claimed to help the smartphone manage internal temperature while playing resource-intensive games. The Nubia Red Magic also sports a dedicated GameBoost button that actives the GameBoost mode to boost the system performance. The gaming mode also enables users to disable incoming calls, messages, and other notifications – all at the flick of a switch. Furthermore, the smartphone has a 16.8-million colour RGB LED strip that sits in line with an aviation-grade aluminium alloy build. The dual-SIM (Nano) Nubia Red Magic runs stock Android 8.1 Oreo and features a 5.99-inch full-HD+ (1080×2160 pixels) LTPS TFT display along with an 18:9 aspect ratio. The display panel is protected 2.5D NEG T2X-1 glass panel. Under the hood, there is an octa-core Qualcomm Snapdragon 835 SoC, paired with Adreno 540 GPU and 8GB of LPDDR4X RAM. Nubia has provided a single, 24-megapixel Samsung 5K2X7SX camera sensor at the back that has 0.9-micron pixel size and an f/1.7 aperture. For selfies, the Red Magic has an 8-megapixel sensor at the front with 1.12-micron pixel size and an f/2.0 aperture. The Nubia Red Magic has 128GB of UFS 2.1 onboard storage. On the connectivity front, the handset has 4G VoLTE, dual-band 2X2 MIMO Wi-Fi 802.11ac, Bluetooth v5.0, GPS, GLONASS, BeiDou, a USB Type-C port, and a 3.5mm headphone jack. Sensors onboard include an accelerometer, ambient light sensor, electronic compass, fingerprint sensor, gyroscope, and proximity sensor. Further, the Nubia Red Magic packs a 3,800mAh battery that supports NeoPower 3.0 and Nubia fast charging technologies. It measures 158.1×74.9×9.5mm and weighs 185 grams.